Week 14 – Taper Like You Mean It! It’s the last week of the official Sunday Long Run schedule. Next week some of us will be spending a nervous weekend preparing their minds for the Boston Marathon! Reminder: You’ve already prepped your body, from here on out its time to let your body heal those little nagging injuries that have piled up. You should run this week, but you shouldn’t train this week. There is no cramming for a marathon. Run easy, eat well, sleep peacefully… you’re ready. This week’s taper run is 12.5 miles. You’ll run some hills, and they aren’t easy ones, but they’ll feel a lot easier than they did in January. I haven’t checked out Spot Pond in its entirety, there is a lot of construction going on at Woodland Rd, but I think we should have a clear path to run around. The Route – You shouldn’t need online directions to get through this one. 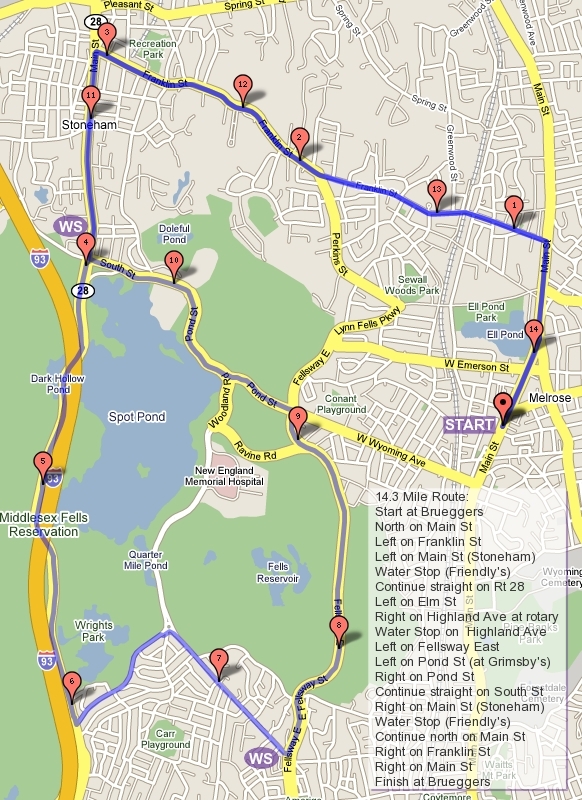 Start – We leave Brueggers and head north on Main Street, one more pass by the Clarence DeMar monument at Ell Pond (if you’re running Boston, let him know). Turn left on Melrose Street and another left on the LynnFells Parkway, running out past Grimsby’s onto the Fellsway East. Run in a taperly fashion through the hills to the traffic circle at Highland where you’ll turn right onto Highland to bring you to water stop 1. Take a break before heading out for more. Half Finish – The half route will go straight through the Highland Ave rotary onto Woodland and run through the construction area to Pond Street where they’ll take a right to head back down to Grimsby’s and straight on to West Wyoming. Turn left on Main Street and finish up at Brueggers! Full 2 – Loop Spot Pond counterclockwise. Yes, you heard me! Continue straight through the Highland Ave rotary onto Woodland with the half runners and continue past the zoo, and turn left into the Straw Point parking lot. Find Hank cranking his tunes and get yourself some water at water stop 2. Full 3 – Keep looping the back side of Spot Pond by taking a left out of Straw Point, running over (not on to) I-93, past the onramp to I-93, under I-93, and over to Elm Street where you turn left. Take your last trip of the season up Elm Street and turn at the rotary back on to Highland for the final water stop. Full Finish – Turn left onto East Border Road and a left again at the traffic lights onto the Fellsway East. Roll through the hills making your way over to Grimsby’s. Turn right on West Wyoming and left on Main Street. Finish up your Boston training at Brueggers! Water Stops Hank will be at his spot, I’ll take Highland, and hopefully I have some company. Big thanks again to the water stop volunteers (especially Hank, Tom, Audrey, and Lois) for getting through a cold, windy, rainy winter and a cold, windy, snowy spring.